Today’s scripture passage is taken from Luke 17: 11-19. We all try to define what a good life is. 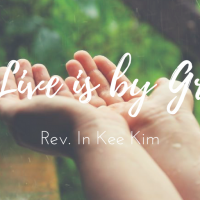 What does it mean to live a good life? We only live once, so I think we all need to live a good life. What is a good life? I was thinking about it, and then this thought came to me. A good life is very simple. Just recognize that your life is by God’s grace. Just that simple recognition, that simple understanding. Your life is by God’s grace. When we recognize that, we can live a good life. I was thinking about Hank and Inha’s father. The last few days he was struggling with his sickness, I visited the hospital he was at. His room was very dark and did not have any windows, but that day was a bright sunny day. And so he asked me, “Reverend, how’s the weather outside? Is it good?” And I said, “Yes the weather is really good, sunny and all that.” And he said, “I won’t be able to see that on a walk, again, will I?” “Who knows? But I hope that you will get better so that you also enjoy the sun.” He was never able to enjoy that sun again. After a few days, he passed away. Just simple things like that we take for granted. The beautiful sun, we can walk around anywhere we want. Just by recognizing that life is by God’s grace, we can appreciate so much about life. St. Paul’s confession came to my mind. He said, “I am who I am by God’s grace and His grace towards me has not been in vain.” That simple sentence has profound meaning. St. Paul recognized that he was who he was by God’s grace, and that grace is never in vain. It is important to remind ourselves continuously that we live by the grace of God. Only when we recognize that our lives are by grace and we live by the grace of God, then we can be thankful. We can live a thankful life, and that is so precious. 10 lepers were there. Only one was able to live a thankful life. They were so focused on their healing, they were so focused on themselves. They could not recognize that their healing was by God’s grace. Only one person was able to confess and say that his healing is by God’s grace. That’s why he came back to Jesus just to simply thank him, and Jesus said, that man gave praise to God, gave glory to God. When we realize that our lives are by God’s grace, then we have this thankfulness and when we express that thankfulness and gratitude to God, that is praising God, and that is the ultimate aim of human being. Our aim is to glorify God and by being thankful we can glorify God. So many people don’t realize that their lives are by God’s grace. Even in today’s scripture, only 10 percent recognize that. In the whole population, even though they have so much, only 10 percent were able to recognize that “my life is by God’s grace”. I’m sure at St. Timothy 90 percent recognize that. Only 10 percent doesn’t recognize. We are very different in that way, but in the whole world, only 10 percent recognize that their life is by God’s grace. Most people don’t recognize that. In Deuteronomy, God said to the Israelites these words; he made water flow for you from Flint Rock and fed you in the wilderness with Manna that your ancestors did not know to humble you and to test you and in the end to do you good. Do not say to yourself, my power and the might of my own hand have gained me this will. Do not say to yourself these things. It is God who gave you all that. Do not say to yourself that with your own strength and with your own power, with your own hand, you made your life. It’s not you who made your life. It is God who blessed you. God cannot freely bless those who do not understand that their life is by God’s grace. You know why? For your sake. If you don’t realize that what you have is by God’s grace, then you take it for granted and you even abuse it. When you abuse the blessing, the blessing turns into a curse. That’s why God cannot freely bless those who do not understand that their life is by God’s grace. Only when you are ready to receive that blessing, God can freely bless you. I think we need the humility to recognize that my life is by God’s grace. In Deuteronomy, he said to humble you and to test you is first and, in the end, to do good to you. First God has to humble us and test us so that in the end we can recognize and appreciate the blessing that we receive from God. What makes us unhappy is the entitlement attitude. The entitlement attitude is a bad thing. When you start living your life with this entitlement attitude, we become very unhappy and we lose our thankful heart. Without a thankful heart, we can never be happy. Even if we don’t have much, if we have a thankful heart within us, we can be happy. That’s what I believe. I believe that even if I don’t have much, if I am full of a thankful heart, I can be happy. I can tell you from my own experience, when I did not have much before, I was happy when I had a thankful heart. A person who takes a simple bowl of rice with the thankful heart is much happier than the person who returns the airplane simply because the stewardess did not serve the macadamia nuts on a nice plate. Who’s happier? Entitlement attitude. It can never make you happy. What I’m saying now is not a theory. This really happened on Korean airlines. Behind the thankful heart there are lot of good spiritual qualities. Humility, patience, consideration, deep understanding and appreciation, gentleness, full satisfaction and love and so on. A thankful heart does not just come. A thankful heart comes when you have these spiritual qualities, and behind the complaining heart, there are a lot of undesirable qualities and characters such as pride, arrogance, selfishness, dissatisfaction, anger, hatred and entitlement attitude and so on. I believe that thankfulness is not a response to our situations. It is not your response. Thankfulness is a viewpoint. It is eyesight. The way you look at the world, the way you look at yourself, and the way you look at life, that’s what thankfulness is. Thankfulness is not a response to the situation around you. Just because all of these things are good, you are thankful. That’s not it. I see a lot of people who have so many things who are never thankful, but the people who don’t have as much as them are thankful because it’s not a response to the situations around us. It is our eyesight, it is our viewpoint. It is how we look at our life, ourselves and our situations. When we have this viewpoint of thankfulness, we’ll be able to see the abundance of life and all of a sudden life becomes beautiful. When you have this thankful heart, everything comes alive. Everything becomes beautiful. The parents that you have, they’re beautiful. The children, they are beautiful. The houses that you live in, they are beautiful. When you have this thankfulness, everything comes alive and everything becomes beautiful. Life itself becomes beautiful. I learned this secret. You can never deal with your shortcomings by having more. By having more, you feel more lacking, so when you feel that you’re lacking something, don’t try to have more because that will intensify your hunger and desire. Do you know how you deal with your shortcomings? By being thankful. When your heart is filled with thankfulness, you don’t feel that you’re lacking anything, so you deal with your shortcomings. When your heart is filled with thankfulness, you never feel that you don’t have enough. That’s why St. Paul said, “I’ve learned to be content in all circumstances. When I’m rich, I’m fine, when I’m poor, I’m fine”, because his heart is full of richness. It’s abundant, so he doesn’t feel lacking in anything. But it’s not just Saints who say that, extraordinary people, smart people will be able to say that. Oprah Winfrey said this, but she’s not a saint. “Be thankful for what you have. You will end up having more. If you concentrate on what you don’t have, you’ll never, ever have enough.” Pretty Smart, Huh? That’s true. That’s what the scripture says. Where Will Your Heart Move to? Let me ask you, if you just leave your heart alone, where do you think your heart will move towards? Will it move towards thankfulness? Or will it move towards complaints? If you just leave your heart alone, let it go wherever it wants to go, where do you think it will go? I believe that your heart will automatically move towards complaint. Why? Because everyone lives with a natural self defense instinct. That’s why people become overly sensitive to dangers around them because we want to protect ourselves. So when imminent dangers come, people are sensitive, and soon you lose your heart to fear. When you lose your heart to fear, you know what the result is? Complaint. I learned this not from psychological books. I learned this from the scripture. The Israelites, when they’re in the wilderness, whenever they face dangers, they lose their hearts to fear and then what? At the end, what did they do? They complained. So our heart, if you just leave it alone, it moves towards complaint. Why am I saying this? Thankfulness is not something that will automatically happen to you. It has to be intentional. You have to practice it. You have to have a spiritual discipline to be thankful. If you’re just natural, you’ll never be thankful, but when you have spiritual discipline to be thankful, only then can you be thankful, and you can create a path through the spiritual discipline so that your heart moves to thankfulness. Your heart is here, if you just leave it alone, you will move to the complaint, but if you create a path through spiritual discipline than this heart will move towards thankfulness, and this thankfulness, once you have it, it will create a new path for you. It will open up a new path for you. The road that leads you to abundance, to joy, and to a bright future. When you have a thankful heart, that road opens up for you. My friends, don’t be too smart. If you’re too smart. You cannot be thankful, because you calculate too much. Then soon you get drunk in your own thinking and you start believing that your thinking is right. You start trusting your own thinking. In the end, we come to the conclusion that I have to make my life with my own hands. That was what God warned the Israelites about in Deuteronomy. Living is by God’s grace. If you don’t realize that, you’re being too smart. If you’re too smart, you make everything complicated. You cannot untangle life that is in tangles. I asked much older fellows in KSM, they’re in their seventies, eighties, and nineties. I asked them this question, “Do you believe that you untangled your life, or your life became untangled?” I told them, I believe that my life becomes untangled. I can never untangle my life. Am I right? They all said with an Amen, you don’t untangle your life. Your life becomes untangled. Everything will be going alright, and the best way to untangle your life is being thankful. When you’re thankful, everything will be alright. You don’t have to worry about it. When this man came back to Jesus to thank him, this was what Jesus said, your faith has made you well. What does that mean? He’s already healed. His leprosy is gone, and now Jesus is saying to the person who’s already healed, your faith has made you well. In other words, your life will be alright from now on. You don’t need to worry about it. And I realized that faith and thankfulness go together. This man believed that he was healed by God’s grace. The other nine did not believe that, but this one person believed that his leprosy was healed by God’s grace. So next time difficulties come in his life, because he already had experience he will believe that he’ll be alright because God is with him. When you live with that kind of attitude, your life will become untangled. You will be alright. Your faith has made you well. You have a wonderful life ahead of you. Don’t make it complicated, and don’t try to untangle on your own. Every moment when you’re thankful, you’ll be alright. Your life will become untangled without you realizing it. “Oh my goodness, all these things happened. Why is this? I don’t deserve this. I didn’t do anything to make these things happen”, but that miracle will happen in your life. You’ll be alright. You don’t need to worry about it. Just be thankful in all circumstances. That is the power to chase away darkness. To chase away complaints. To chase away negative thinking. Be strong.